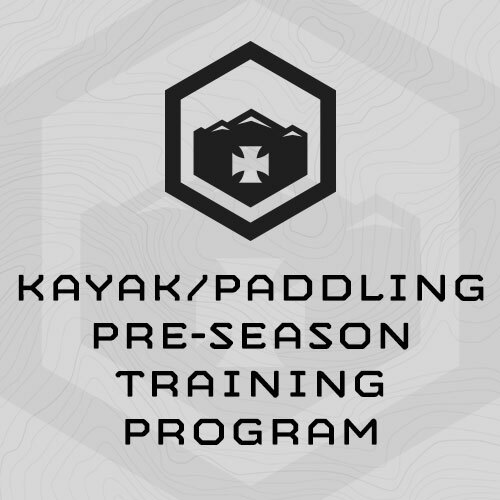 This 6-Week, 4 day/week Sport-Specific pre-season training program is for kayakers, canoeists and other river athletes. It is designed to be completed directly before the paddling season. (1) Develop the strength, power, and strength endurance of your upper body and core. Upper body pressing and pulling strength, power and strength endurance are the primary drivers of paddling performance. This training program hammers your upper body and midsection. (2) Train your paddling-specific work capacity/energy system (lungs and heart). Your lungs and heart are the drivers behind your paddling muscles. We train these sport-specifically through hard paddling intervals on the water. (3) Increase your overall strength and mental fitness so you are more durable. We understand the danger of kayaking and the other paddling sports. In our experience, stronger athletes are simply harder to injure. Mentally fit athletes never give up. Note: The Tuesday and Thursday work capacity training is this plan has you paddling in water. Here in Wyoming we paddled against the flow of the Snake River – in snowy/icy March! You can also complete these intervals in a lake. - Open water for the paddling intervals - river, lake, pond, etc. Drysuit if it's cold. (1) Max reps Alternating Dumbbell Bench Press @ 20#/35# in 90 sec. (3) Max Reps Dumbbell Russian Twists w/ 20#/35# in 90 sec. Max Reps Alternating Dumbbell Bench Press @ 20#/35# in 60 sec. Max Reps Renegade Rows @ 20#/35# in 60 sec. Max Reps Russian Twists w/ 20#/35# in 60 sec.